Darwinism is a theory of biological evolution developed by the English naturalist Charles Darwin and others, stating that all species of organisms arise and develop through the natural selection of small, inherited variations that increase the individual's ability to compete, survive, and reproduce. 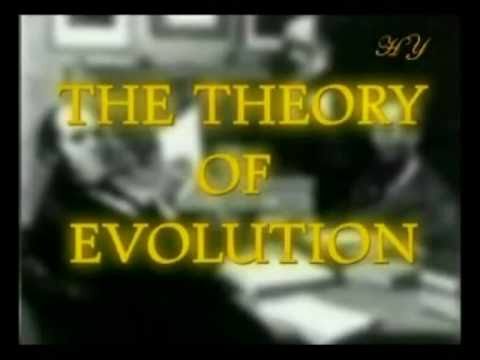 Also called Darwinian theory, it originally included the broad concepts of transmutation of species or of evolution which gained general scientific acceptance after Darwin published On the Origin of Species in 1859, including concepts which predated Darwin's theories, but subsequently referred to specific concepts of natural selection, of the Weismann barrier or in genetics of the central dogma of molecular biology. Though the term usually refers strictly to biological evolution, creationists have appropriated it to refer to the origin of life, and it has even been applied to concepts of cosmic evolution, both of which have no connection to Darwin's work. It is therefore considered the belief and acceptance of Darwin's and of his predecessors' work—in place of other theories, including divine design and extraterrestrial origins. Darwin's Theory of Evolution is the widely held notion that all life is related and has descended from a common ancestor: the birds and the bananas, the fishes and the flowers -- all related. Darwin's general theory presumes the development of life from non-life and stresses a purely naturalistic (undirected) "descent with modification". That is, complex creatures evolve from more simplistic ancestors naturally over time. In a nutshell, as random genetic mutations occur within an organism's genetic code, the beneficial mutations are preserved because they aid survival -- a process known as "natural selection." These beneficial mutations are passed on to the next generation. Over time, beneficial mutations accumulate and the result is an entirely different organism (not just a variation of the original, but an entirely different creature). While Darwin's Theory of Evolution is a relatively young archetype, the evolutionary worldview itself is as old as antiquity. Ancient Greek philosophers such as Anaximander postulated the development of life from non-life and the evolutionary descent of man from animal. Charles Darwin simply brought something new to the old philosophy -- a plausible mechanism called "natural selection." Natural selection acts to preserve and accumulate minor advantageous genetic mutations. Suppose a member of a species developed a functional advantage (it grew wings and learned to fly). Its offspring would inherit that advantage and pass it on to their offspring. The inferior (disadvantaged) members of the same species would gradually die out, leaving only the superior (advantaged) members of the species. Natural selection is the preservation of a functional advantage that enables a species to compete better in the wild. Natural selection is the naturalistic equivalent to domestic breeding. Over the centuries, human breeders have produced dramatic changes in domestic animal populations by selecting individuals to breed. Breeders eliminate undesirable traits gradually over time. Similarly, natural selection eliminates inferior species gradually over time. 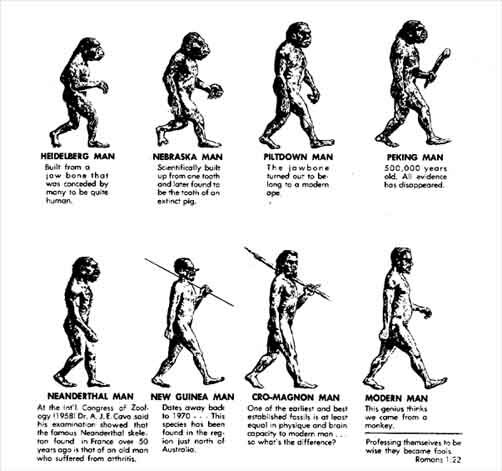 Darwin's Theory of Evolution is a slow gradual process. Darwin wrote, "…Natural selection acts only by taking advantage of slight successive variations; she can never take a great and sudden leap, but must advance by short and sure, though slow steps." Thus, Darwin conceded that, "If it could be demonstrated that any complex organ existed, which could not possibly have been formed by numerous, successive, slight modifications, my theory would absolutely break down." Such a complex organ would be known as an "irreducibly complex system". An irreducibly complex system is one composed of multiple parts, all of which are necessary for the system to function. If even one part is missing, the entire system will fail to function. Every individual part is integral. Thus, such a system could not have evolved slowly, piece by piece. The common mousetrap is an everyday non-biological example of irreducible complexity. It is composed of five basic parts: a catch (to hold the bait), a powerful spring, a thin rod called "the hammer," a holding bar to secure the hammer in place, and a platform to mount the trap. If any one of these parts is missing, the mechanism will not work. Each individual part is integral. The mousetrap is irreducibly complex. Darwin's Theory of Evolution is a theory in crisis in light of the tremendous advances we've made in molecular biology, biochemistry and genetics over the past fifty years. We now know that there are in fact tens of thousands of irreducibly complex systems on the cellular level. Specified complexity pervades the microscopic biological world. Molecular biologist Michael Denton wrote, "Although the tiniest bacterial cells are incredibly small, weighing less than 10-12 grams, each is in effect a veritable micro-miniaturized factory containing thousands of exquisitely designed pieces of intricate molecular machinery, made up altogether of one hundred thousand million atoms, far more complicated than any machinery built by man and absolutely without parallel in the non-living world." And we don't need a microscope to observe irreducible complexity. The eye, the ear and the heart are all examples of irreducible complexity, though they were not recognized as such in Darwin's day. Nevertheless, Darwin confessed, "To suppose that the eye with all its inimitable contrivances for adjusting the focus to different distances, for admitting different amounts of light, and for the correction of spherical and chromatic aberration, could have been formed by natural selection.